MatTek’s human 3D in vitro respiratory tissue model is redefining preclinical testing in the areas of toxicology, viral research, inflammation & fibrosis and drug development. MatTek’s 3D tissue models of the human airway are advancing in vitro respiratory research worldwide. Allowing for physiological exposures to pathogens, chemicals or therapeutics, EpiAirway’s human-relevant biological responses are changing the way scientists research respiratory diseases and drug development. Let EpiAirway advance your science. 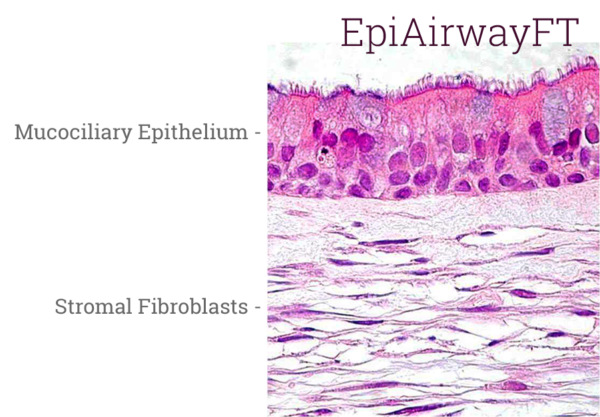 EpiAirway is a ready-to-use, 3D mucociliary tissue model consisting of normal, human-derived tracheal/bronchial epithelial cells also available as a co-culture system with normal human stromal fibroblasts (EpiAirwayFT). Cultured at the air-liquid interface (ALI), EpiAirway recapitulates the in vivo phenotypes of barrier, mucociliary responses, infection, toxicity responses and disease. With over 100 technical references available, EpiAirway is amenable to acute or long-term chronic studies across a wide range of highly predictive in vitro applications. EpiAirway at 6 weeks in culture. EpiAirway exhibits human relevant tissue structure and cellular morphology with high uniformity and reproducibility. Its 3D structure consists of organized Keratin 5+ basal cells, mucus producing goblet cells, functional tight junctions and beating cilia. EpiAirwayFT incorporates human fibroblasts in an extracellular stromal matrix ideal for inflammation and fibrosis research. The EpiAirway 3D human tissue model is routinely utilized for a range of applications including safety & risk assessment, anti-viral research, inflammation & fibrosis and drug delivery. Simple protocols and the evaluation of early cellular endpoints allow scientists to acquire data in days, not weeks or months. Use EpiAirway to study respiratory virus attachment, replication, innate immune responses and anti-viral drug development. Utilize existing transdermal permeation equipment or MatTek’s simple single insert permeation devices to assess API permeation and flux. Use EpiAirway (available in several formats for physiological exposure systems) to determine relative safety with the EpiAirway IC-75 assay. Employ EpiAirway’s diverse donor inventory of healthy and diseased donors (Asthma, COPD, Smoker, Goblet Cell Hyperplasia) to elucidate molecular pathways and assess therapeutic efficacy. Lot numbers: Tissue lots produced each week are assigned a specific lot number. A letter of the alphabet is appended to the end of the lot number to differentiate between individual kits within a given lot of tissues. All tissue kits within a lot are identical in regards to cells, medium, handling, culture conditions, etc. Length of experiments: Tissue cultures can be continued for THREE (3) MONTHS or more with good retention of normal morphology. Tissues must be fed every other day with 5.0 ml of maintenance medium (AIR-100-MM). Cell culture inserts are placed atop washers (EPI-WSHR) or culture stands (MEL-STND) in 6-well plates to allow us of 5.0 ml. See technical reference #631. Alternatives: Phenol red-free, antibiotic-free, anti-fungal-free medium and tissues are available. Agents are removed at least 3 days prior to shipment. End-use testing: Transepithelial electrical resistance (TEER) of each EpiAirway lot is measured using an EVOM2 epithelial Volthommeter and Endohm electrode chamber (World Precision Instruments). A minimum TEER of 300 Ohm • cm2 is required for QC release. Request a quote for one of our in vitro tissue products and a member from our team will contact you immediately. We need your shipping address to include a freight estimate for your shipment. Cultured at the Air-liquid Interface, EpiAirway’s mucociliary 3D tissue structure allows for human relevant exposure to test materials.